"Come. Follow me," Jesus said. "I will make you fishers of people" Matthew 4:19 (NIRV). You need: One fresh, whole fish (head and all), 2-3 colors of fabric paint, fabric marker or Scribbles paint, white t-shirt. Place wax paper or several sheets of newspaper on the inside body of t-shirt. Place the fish on a sturdy cork bulletin board. Stretch open the fins and pin them to the corkboard using straight pins. Have children take turns lightly painting the fish with fabric paint. Place the t-shirt on top of the painted fish and press lightly, then lift off and allow to dry. 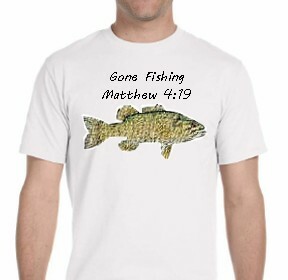 Using fabric marker or Scribbles paint write, "Gone Fishing" above the fish, and "Matthew 4:19" below the fish.